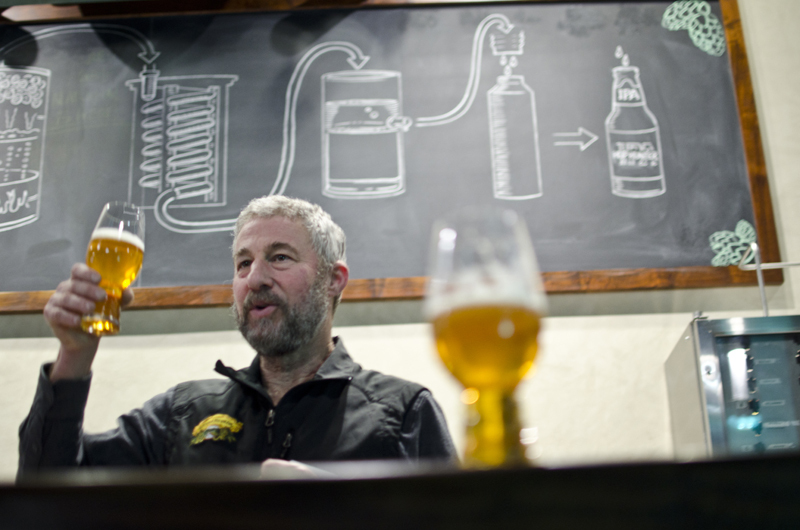 BERKELEY, Calif.—There are obvious nods to Sierra Nevada Brewing Co.’s heritage and culture at the Torpedo Room. Decades-old kegs, converted into light fixtures, glow overhead. A mural of brew kettles covers one wall. A steel carving of the brewery’s logo, the width of a big-screen TV, hangs above the bar, which is framed by replica torpedoes, the stainless steel dry-hopping devices invented by the brewery. Random as it may seem to set up an outpost sans brewery on a quiet street here rather than nearby San Francisco, Ken Grossman cites Berkeley-based restaurant Chez Panisse as Sierra Nevada’s first key account. More than one year after opening, the Torpedo Room (2031 Fourth St.) is a fixture in the neighborhood and a center for beer education. It has hosted special events, including a science-focused evening with Tom Nielsen (the brewery’s technical lead on flavor and raw ingredients research) and a beer tasting with Brian Grossman of Sierra Nevada and Vinnie Cilurzo of Russian River Brewing Co.
On a recent Friday night, the 16 draft beers included regular standbys, seasonal releases, offerings from Sierra Nevada’s Beer Camp program and several vintages (dating back to 2009) of Bigfoot Barleywine Style Ale. Bartenders guided newcomers in choosing 4-ounce samples and offered recommendations to regulars stopping by to fill growlers. With so many options, it would be easy to linger, but the small pours (the Torpedo Room doesn’t offer pints) promote tasting and keep visitors moving in and out of the intimate space.